Eggs are a perfect addition to our breakfast meals but one bad boiled egg can ruin your day. You finished boiling some eggs, you try to peel it but the egg shell takes most of the albumen with it giving you this bumpy uneven boiled eggs. You cut the egg into two or bite into it and you can perceive the rotten smell. And you are sure these are very fresh eggs. There's also an unattractive greenish colour around the egg yolks. So why does boiled egg smell? Why is the outer part of the egg yolk green? Hard boiled eggs smell badly (like sulphur) when they are overcooked. It is also for this same reason that the outside of the egg yolk turns green. So to solve these two problems, do not overcook your eggs. But how long is too long? Here's how to make the perfect hard-boiled eggs that is free from the foul smelling odour, peels easily and without the unattractive green colour around the egg yolk. Place the eggs in a pot and pour cool water to cover the eggs. Cover the pot and start cooking on high heat. Once the water starts boiling, the kind of boiling that causes the eggs to roll around in the pot, turn off the heat. Remove the pot from the burner and place on another cool burner or on a cool surface. This is especially important if you cook with a hot plate, a vitro ceramic cooker or any cooker that continues to heat the pot after you have turned off the heat. Leave the eggs in that pot for 10 minutes. Set a timer if you have to but it is important that the eggs stay in the pot for 10 minutes maximum after you have turned off the heat. After 10 minutes, transfer the eggs to a bowl of ice cold water and leave till the eggs have cooled down completely. 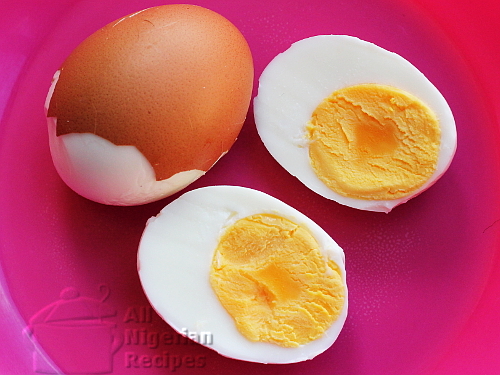 If you have been having problems making perfect hard-boiled eggs, try this method and you will confess. *wink! Use it for the Classic Nigerian Salad, Bird's Nest Salad or eat like that with your breakfast.